Qualibuild — Danielle Townsend Design Graphic Design and Brand Identity Design Dublin, Danielle Townsend Design is a Graphic Design and Visual Thinking agency based in Dublin. To create a brand and guidelines for Qualibuild, a European Commission funded initiative, managed and coordinated by Limerick Institute of Technology (LIT) with partners Dublin Institute of Technology (DIT), Blanchardstown Institute of Technology (ITB), the Irish Green Building Council (IGBC) and The Construction Industry Federation (CIF). The Brand QualiBuild must assist in adding transparency to the building sector and to improve standards by providing training for those employed in this sector, and register for those who want to employ an approved level of craft worker. The core values for the brand are Quality, Knowledge, and Openness. These values assist in visually articulating the brand message. Quality has been chosen in an attempt not to categorize the brand as ‘green’ or ‘sustainable’ but rather to highlight a sector operating at a higher level. Knowledge will demonstrate the core function of the initiative - training. Openness will attempt to aid in the transparency of the initiative to allow consumers and developers alike to make informed choices regarding the workers they employ. 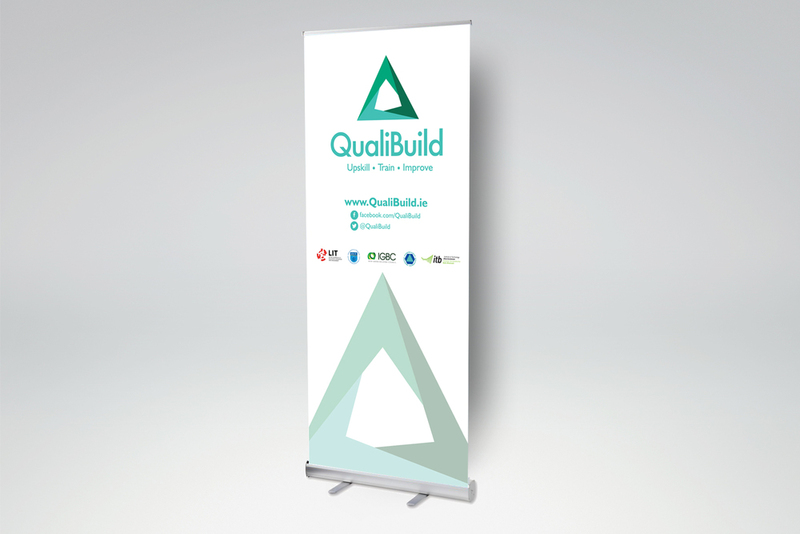 The logo for Qualibuild has been developed to exist as a mark of quality - to be a standard in training and education and to represent the industry in a holistic way. The modern palette was chosen to communicate these values. The brand marque was developed to work as a positive marque of three parts to represent the three stockholders. The typeface chosen is geometric in its construction which references the built environment. Brand guidelines were produced and a range of marketing material is currently in production.